Francisco J. Ayala is Donald Bren Professor of Biological Sciences at the University of California, Irvine, USA. He is a member of the U.S. National Academy of Sciences, the American Academy of Arts and Sciences, and the American Philosophical Society. In 2001, he received the National Medal of Science. Ayala has published more than 950 articles and is the author or editor of 31 books. He has been named the Renaissance Man of Evolutionary Biology by The New York Times. Robert Arp is an analyst at The Analysis Group, LLC who has interests in philosophy of biology and ontology in the informatics sense. He is the author of Scenario Visualization: An Evolutionary Account of Creative Problem Solving (2008), and co-editor of Philosophy of Biology: An Anthology (Blackwell, 2009). Part I: Is It Possible to Reduce Biological Explanations to Explanations in Chemistry and/or Physics? Part II: Have Traits Evolved to Function the Way They Do Because of a Past Advantage? Part III: Are Species Real? Part IV: Does Selection Operate Primarily on Genes? Part V: Are Microevolution and Macroevolution Governed by the Same Processes? Part VI: Does Evolutionary Developmental Biology Offer a Significant Challenge to the Neo-Darwinian Paradigm? Part VII: Were the Basic Components of the Human Mind Solidified During the Pleistocene Epoch? Part VIII: Does Memetics Provide a Useful Way of Understanding Cultural Evolution? Part IX: Can the Biological Sciences Act as a Ground for Ethics? 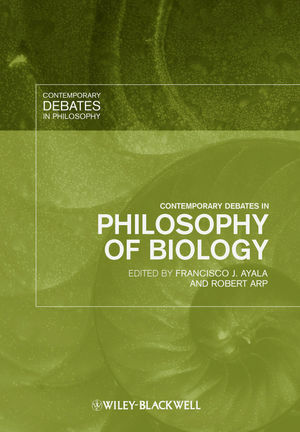 Part X: Is There a Place for Intelligent Design in the Philosophy of Biology?